In this scenario, in the "opinion" of the CAFICS and AFICS/NY presidents, the UN Secretary-General took action to replace his Representative for Investments and, in effect, place the CEO in charge of the Fund on probation, based merely on "exaggerated....rumours and allegations concerning the management of operations and investments ." 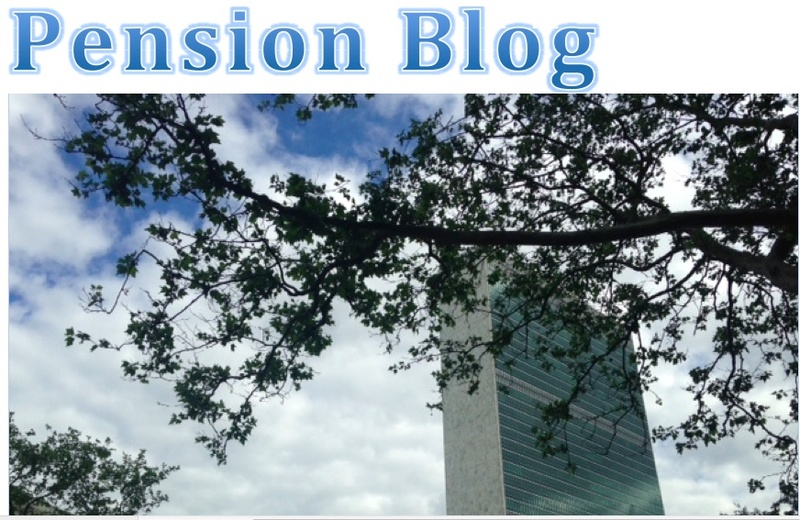 A UN retiree raised today on FCUNS Facebook the issue of the need to reach out to UN retiree organizations worldwide (Associations of Former International Civil Servants) to keep them apprised of issues concerning the UN Pension Fund. This is important the recent letter from AFICS Australia indicating that they've not been kept informed by the FAFICS leadership (Federation of Associations of Former International Civll Servants). A more recent letter from CAFICS (AFICS Canada) also highlights the importance of these organizations receiving accurate and updated information. The pension blog has made efforts to contact those organizations for whom there's correct contact information. On misinformation concerning the backlog in pension payments alone, as mentioned in my notes of the pension information briefing conducted at UN HQ on 21 March 2018 by the UN Participant Representatives to the Pension Board, there's finally consensus, including from the Fund management that the total number of persons affected by the backlog in pension payments is 15,000, retirees and their survivors. But one would have no idea based on information coming from FAFICS and AFICS/NY. Recall that the FAFICS president (Federation of Associations of Former International Civil Servants) claimed (as part of her misinformation campaign) stated in her 8 January 2018 "update" to FAFICS members worldwide that the "backlog is largely a thing of the past." The FAFICS leadership has systematically withheld information and deliberately manipulated the flow of information to these organizations. (Recall AFICS Australia's letter of 20 February 2018 to its members when it stated that the FAFICS president needs to be reminded that her job is to support the interests of UN retirees, not the CEO! The letter was posted on FCUNS some weeks ago and is on the pension blog). As more indication of how strongly the FAFICS leadership and AFICS/NY strive to control the flow of information, see below a letter from AFICS Canada sent to its members on 7 March 2018 in which he states: "In light of the AFICS’ position and our own research, we wish to assure you that all these rumours and allegations concerning the management of operations and investments are, in our opinion, exaggerated. …..After a considerable effort, the problem of the backlog has been resolved and the average processing time is now at least equal if not better than prior to 2015." The "problem of the backlog has been resolved" if one neglects to take account of the small problem of 15,000 outstanding cases of retirees and their survivors including widows and orphans! One wouldn't know from the AFICS Canada president's letter where he describes his contact with the AFICS/NY president, about the disturbing findings of UN internal audits about the extent of the backlog in pension payments, mismanagement of IPAS implementation that caused the backlog, irregularities in contracts and procurement, or the leadership vacuum in the Fund Secretariat. Not to mention the information in Board of Auditor and ACABQ reports, and General Assembly resolution 72/262 about chronic underperformance in investments and massive foreign currency losses, the debacle of the actuarial valuation, problems with client grievance, lack of implementation of Board of Auditor recommendations, the large problem of vacant posts, or the dysfunctional Pension Board as one of the reasons for the General Assembly calling (in resolution 72/262) for a governance audit, to include checks and balances between the Board and the Fund leadership, etc. "It's all fine, no cause for alarm, go back to sleep...." according to the FAFICS and AFICS/NY presidents. In recent months, rumours have circulated on social networks and e-mails about the administration and leadership of some senior officials of the United Nations Joint Staff Pension Fund. As your representatives, our responsibility was to do some research to clarify this situation. Therefore we contacted the President of AFICS / NY, Mr. John Dietz, to ascertain the position of his association on this topic because of the proximity of his association with the UNJSPF and also the fact that he had worked for more than 20 years in the Pension Fund. In light of the AFICS’ position and our own research, we wish to assure you that all these rumours and allegations concerning the management of operations and investments are, in our opinion, exaggerated. At the operational level, when the Pension Fund and the UN adopted a new computer system in 2015 (IPAS for UNJSPF and UMOJA for the UN), significant delays were recorded in the processing and payment of benefits to new retirees. After a considerable effort, the problem of the backlog has been resolved and the average processing time is now at least equal if not better than prior to 2015. There were also concerns about the performance and management of the investments of the Fund. We wish to inform you that the Secretary-General of the United Nations appointed, in early 2018, a new person as Representative of the Secretary General (RSG) for the Investments of the Pension Fund, Mr. Sudhir Rajkumar, whose extensive experience in pension funds and investments is reassuring. n addition, as all markets performed well in 2017, the Fund's investments also reached $64 billion at the end of the year. With the volatility of the markets so far in 2018, the investments are about the same as at the end of 2017. We are therefore convinced that there is no cause for alarm regarding the Pension Fund. However, as retiree representatives, we must be vigilant to protect the interests of retirees and ensure that the Pension Fund continues to serve its members and beneficiaries around the world.